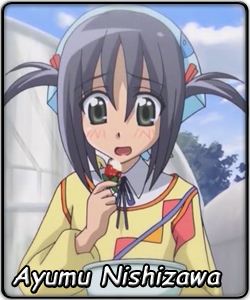 In every episode of the anime, Nishizawa Ayumu gets a short cameo scene if she isn't the focus of the episode. Known as "Nom-Nom-tan" (Nom Nom is an onomatopoeia for eating), she is constantly eating something while miraculously never getting fat or diseased. She has a crush on Hayate but couldn't get the courage to confess while he was around at school. Now, after disappearing for some months, she sees him again at school and confesses - only to get rejected in a lousy roundabout way. Not deterred by this, Ayumu continues to go after Hayate and learns that he's now a debt-ridden butler at the ultra-prosperous Sanzenin family's estate. Specifically, that he's the butler of the young mistress of that huge mansion... and that said mistress is also in love with Hayate. When Ayumu and Nagi first met, they instinctively knew they would be rivals to fight over Hayate. In a delightful metaphorical stand-off scene, Nagi's avatar was a dragon and Ayumu was represented by... a hamster... which got eaten by the dragon. Ayumu retreated from the field that day but swore she'd bring 'a stronger hamster avatar' next time. The two rivals then become friends. Even though Nagi is so rich, Ayumu insists on treating her out of her own pocket like she would any other friend. In one episode, when Nagi was brooding over how Hayate's taste in women leaned towards "the ordinary girl," she ended up staying at Ayumu's home to learn of 'being ordinary'. Although she was a great inconvenience, Ayumu did not chase her away and remained hospitable. She has also stood up to defend Nagi when a giant monster turtle (don't ask, that lake in the Sanzenin mansion's lands has a strange ecology) loomed over them. Shaking with fear and armed only with a stick, she nevertheless made a stand for Nagi.